Sarah Beth Elkins hand-throws each piece, adding fine ridges, a twisting vine, and vibrant glaze. For those of us who love fall, the glimpse of a portly pumpkin in the garden or on the porch is as welcome as that first breath of crisp morning air. 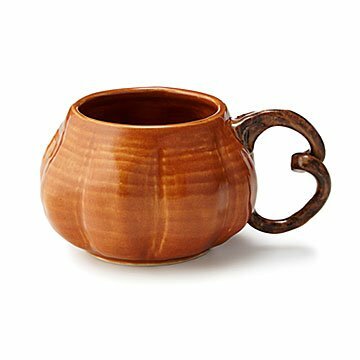 Drink that feeling in year-round with this sculptural stoneware mug from ceramicist Sarah Beth Elkins. Each piece is hand-thrown on a potter's wheel before adding the characteristic ridges, twisting vine handle, and vibrant, autumnal glaze. The organic shape feels so good cradled in your hands, whether you"re waking up with coffee on a chilly morning, or curled up with the family for cocoa by the fire. Handmade in Houston, Texas. As a child, Sarah Beth Elkins was encouraged to explore her creativity and grow as an artist. Her father is a graphic designer by trade, but has always been a fine artist at heart. He was always trying new mediums and experimenting with new techniques, with Sarah Beth and her sisters at his heels. Sarah Beth went on to college to receive a BFA in Studio Art, where she started experimenting with clay in the campus ceramics lab. After graduating, she taught high school art for six years, but with the encouragement of her husband, left teaching and hit the ground running with her own art. She now works from her home studio and loves every minute she spends there. Find out more about Sarah Beth and her past as a high school teacher on our blog.